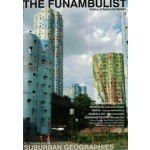 This 2nd issue of THE FUNAMBULIST has a significant part of its content dedicated to the French banlieues (photographs by Adel Tincelin and article by Hacène Belmessous about police urban planning in particular), it examines many more peripheral forms of urbanity that are all characterized by voluntary or forced segregated territoriality. 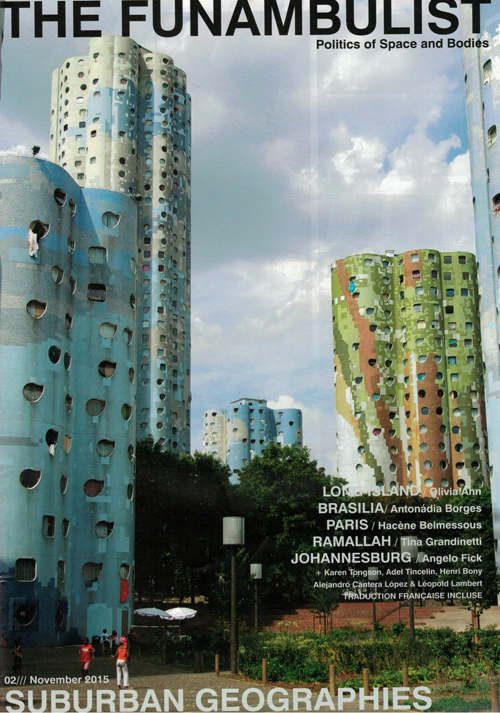 In the case of Brasilia, anthropologist Antonádia Borges uses the two opposite figures of the miss and the misfit to describe how the canonical architectural city only hosts the highest social class of the city, while the working class live in poorly connected satellite cities. On the contrary, Tina Grandinetti gives us a critical reading of the voluntary withdrawal of the city center of Ramallah by the Palestinian middle class to favor newly built neighborhoods/towns, like Rawabi to live apart from the rest of society, in a normalization process of the Israeli occupation. In Johannesburg, Angelo Fick uses the example of the suburban neighborhood of Killarney to describe the urban reminiscences of the South African apartheid that still operate as a segregative device. The American suburbia is also a predominant paradigm throughout this issue, in particular through Olivia Ahn‘s article about the suburban house as a post-war gender productive apparatus, and the Archipelago interview with Karen Tongson about Los Angeles’ queer suburban imaginaries. As usual, student works are also put forward in relation to the topic with projects in Madrid (Alejandro Cantera López), Paris (Henri Bony) and Long Island (Olivia Ahn). I hope that this issue will contribute to a productive debate in the severe role played by urbanism, architecture, design in the segregative organization of territory, as well as the potentiality to subvert — Olivia Ahn would say “to queer” — these mechanisms in order to dissolve the gender, racial and social violence this segregation produces.